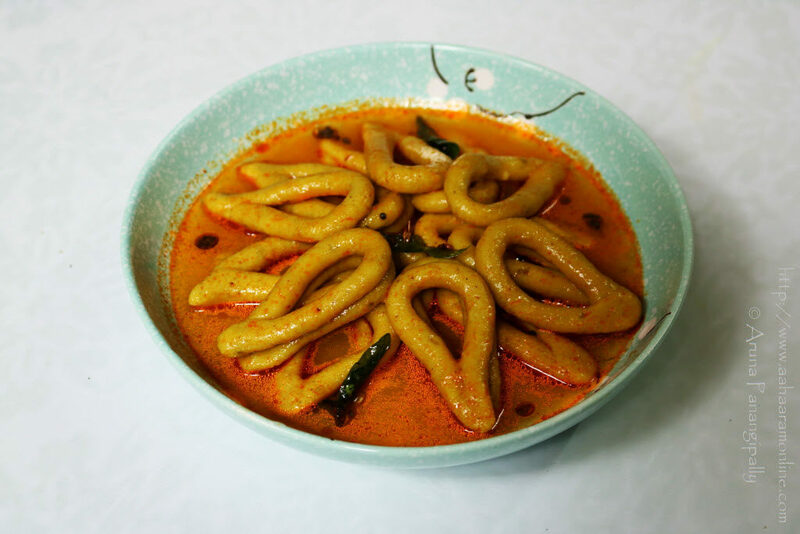 I had planned to make a whole lot of desserts over the weekend but then ditched that plan to make Shengole, which I have heard described as a “fresh hand-rolled pasta” from Maharashtra. 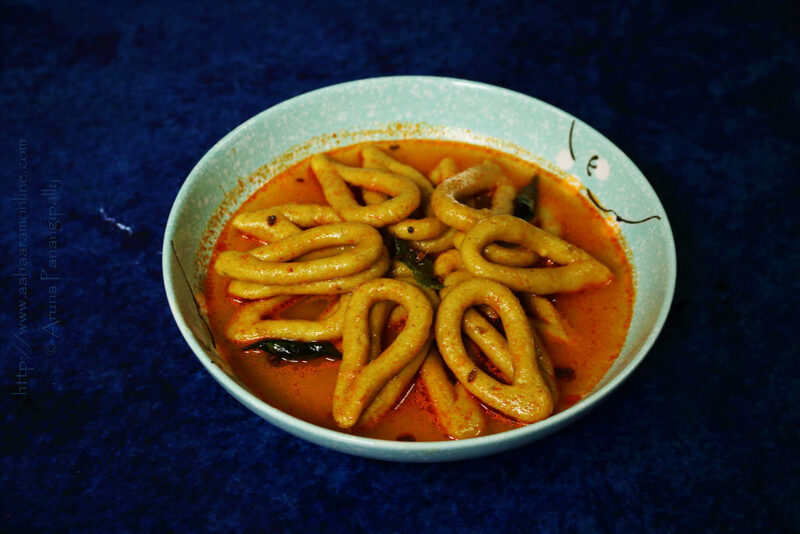 The trigger for making this spicy and filling one-dish meal was the incessant rain in Mumbai that always makes me crave hot and spicy food. Maharashtra is a treasure trove of wonderful one-dish meals and snacks. 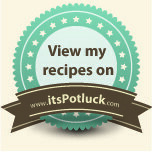 Do try my recipes for Dadpe Pohe, Jowar Flour Upma, Nivagrya, Bharda Bhat and more. 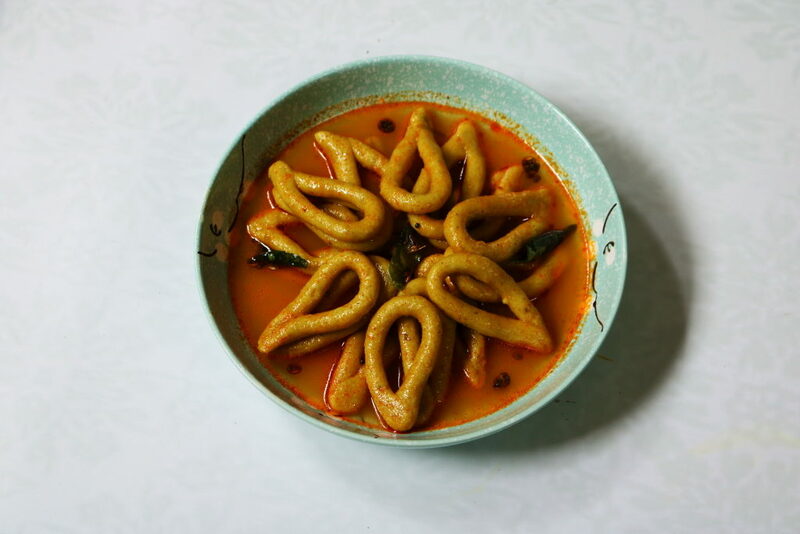 Shengole are small rings made with a spiced dough of jowar flour, wheat flour, and besan, and then simmered in water flavoured with red chilli powder and turmeric. 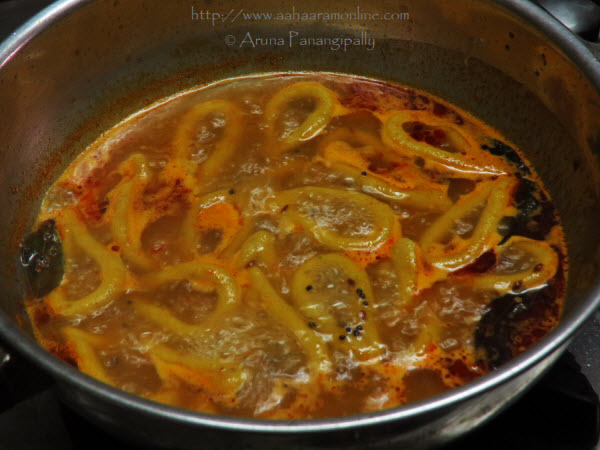 Simply delicious when eaten hot with some ghee on top. In a large bowl, mix together all the ingredients except the water. Gradually add the warm water and make soft dough. Important: Set aside 1" ball of the Shengole dough for thickening the gravy. Take about a 1" ball of the dough and roll it into a pipe about 5" long and 1/4" thick. Bring together the ends and press them together to form a tear-shaped Shengole. Repeat the process to make all the Shengole. Add the cumin seeds and stir-fry till they change colour. 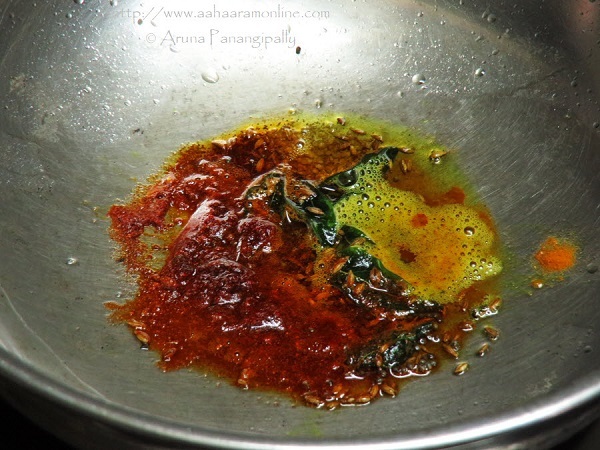 Add curry leaves, turmeric, and chilli powder. Add 2 cups of water and some salt, and bring the water to boil. Turn the heat down to low and add the shengole to the simmering water. Turn the heat up to medium, and let the shengole cook in the simmering water for about 8 minutes, or till they are cooked through. While the Shengole are cooking, dissolve the 1" ball of dough that we had reserved in 1/4 cup water. When the shengole are cooked, add the dough water to the gravy and simmer for 5 minutes till it is a bit thick. 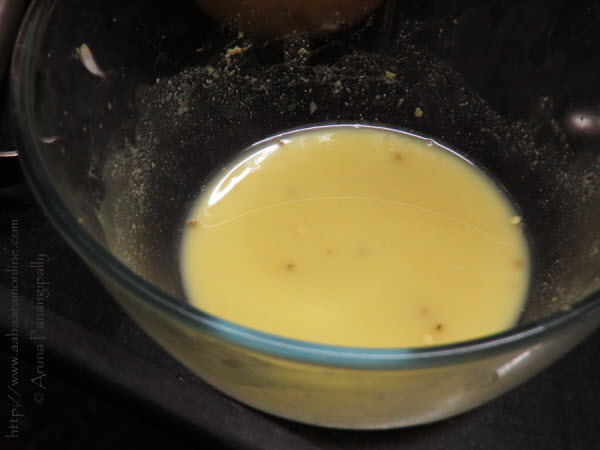 Serve immediately with some ghee on top. I ground 4 spicy green chillies with about 3 large cloves of garlic to create a green chilli-garlic paste. 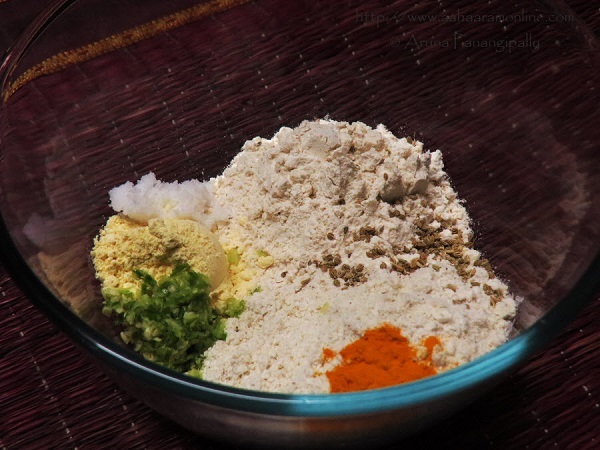 To a large bowl, add the three flours, chilli paste, garlic paste, ajwain, salt, and turmeric. Gradually add the warm water and knead into a soft dough. I needed just a tad bit more than 1/4 cup water. 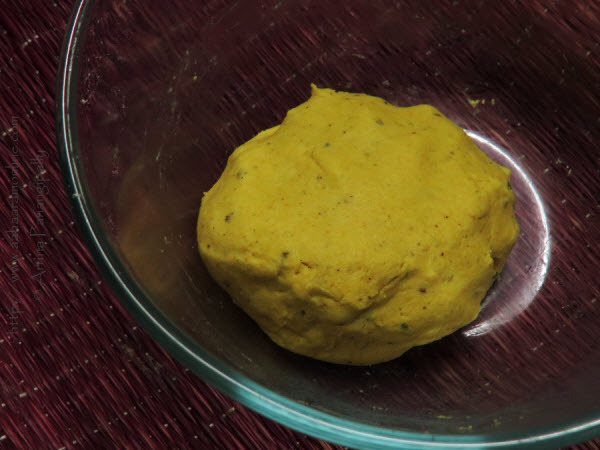 Important: Take a 1″ ball of the dough and dissolve it in 1/4 cup water. We will use this to thicken the gravy at the very end. Roll a 1″ ball of dough between your palms to form a 4″ long tube that is about 1/4″ in diameter (thick). Grease your palms with a few drops of oil if you feel the dough sticking. 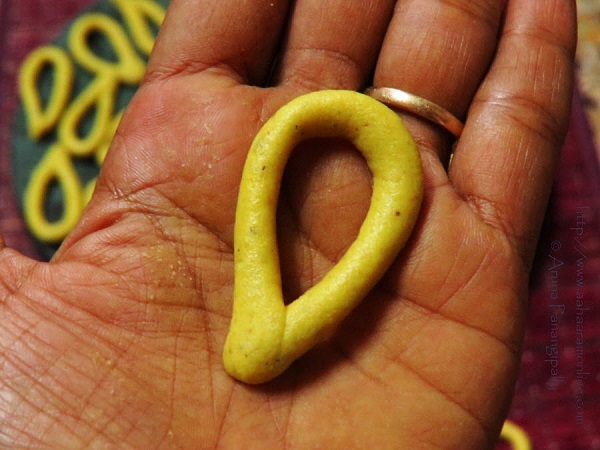 Bring the ends together and gently press them together to form a tear-shaped Shengole. Repeat the process to make the rest of the Shengole. In a wide kadhai or vessel, over a medium flame, heat the oil. 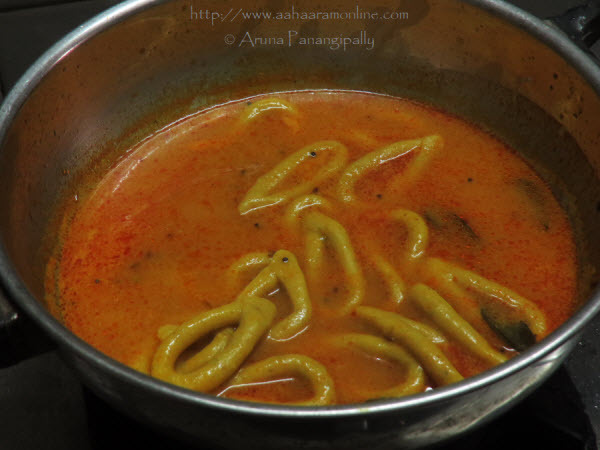 Use a large kadhai so that the Shengole have some space to boil. First, fry the mustard seeds till they crackle. Next add cumin seeds and stir-fry till they change colour. 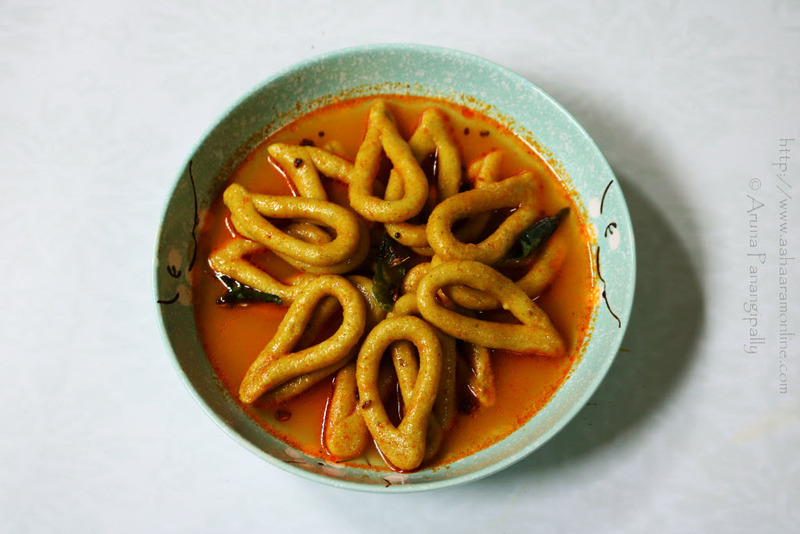 Now, turn the heat down to low, and add the curry leaves, turmeric, and chilli powder. Immediately add 2 cups of water and some salt, and turn the heat up to medium, and bring the water to boil. When the water has started boiling, reduce the flame to low, and gently slide the shengole to the simmering water. Turn the heat up to medium, and let the shengole cook in the simmering water for 8 to 10 minutes, or till they are cooked through. After the shengole are cooked, turn the heat down to low, and add the dough water to the gravy. Simmer for 5 minutes till the gravy thickens. These are like beautiful little tear-drops! I loved reading the process and such great detail, too! 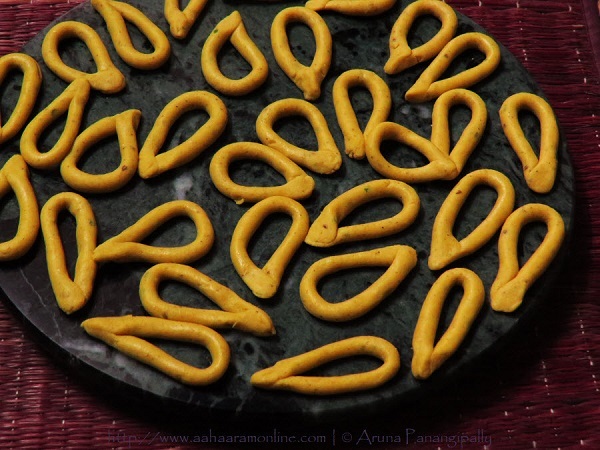 Thanks for sharing such traditional recipes Aruna! Thanks, Aanchal. Love the name of your blog. ?? Mumbai weather certainly makes you want to eat these! Love the way you have decorated them in the bowl. Oh my! They look delicious.